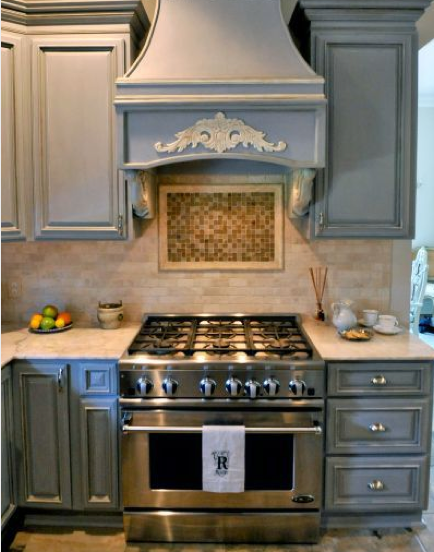 ARE YOU PLANNING TO PAINT YOUR KITCHEN CABINETS? HERE IS ADVICE ON USING ANNIE SLOAN'S SOFT WAX AND HOW TO PREP THE SURFACE. HOW DO I PREPARE THE SURFACE OF MY CABINETS? DO I NEED TO SAND? dusting off the surface will do. There may be times, however, when you’ll need to sand to remove loose paint, rust, and other surface debris, or when the surface is very glossy (this includes melamine and laminates). Remember to change out your piece of sandpaper when it becomes clogged with old paint, etc. A fresh sheet makes the task at hand easier to accomplish. HOW DURABLE IS A WAX FINISH? When wax is first "harvested" it is in a hard form ... so hard that it can rarely be used that way. So it is softened with a solvent (ours is white spirits) that allows the wax to be easily applied. Once the wax has dried and cured (meaning the solvents have evaporated), the wax is hard again. Is it durable? Yes, under normal wear and tear. Can it be scratched? Yes, just like any other durable clear finish (think of your car). Can it be repaired? Yes, and much more easily than a varnish finish. SHOULD I USE DARK WAX? I HEAR THAT IT CAN BE DIFFICULT TO USE. Dark Wax can lend a gorgeous, aged patina to your finish. But for many new to using wax, it can take practice before attempting a large project with lots of big, flat areas to cover. At Bella B Décor, we suggest using Dark Wax just in the creases of the panels. It's easy to do with a small brush, and very attractive. View all of our Annie Sloan product FAQs here.